Thomas Young could get his Six Nations chance for Wales against Italy. Pic: Getty Images. Robin McBryde has warned the Welsh players “not to slip into holiday mode” as they prepare for Saturday’s Round 2 Guinness Six Nations clash with Italy in Rome. The Welsh squad headed to the south of France in the wake of their 24-19 victory over the French on Friday night and are spending the week in Nice as they prepare to tackle the Azzurri at Stadio Olimpico. There are 31 players to the Riviera training camp, but after two days recovery they have been into hard work ever since as they look to keep to winning ways head of their first home assignment against England on 23 February. “You couldn’t ask for better surroundings – it’s very reminiscent of Llandudno, so I feel at home,” quipped McBryde. “It’s been good to recuperate after a tough match last Friday night, but we have to be aware not to slip into holiday mode. “It’s been good to have a change and it has worked well in preparation for the Rugby World Cup. Having a squad of 31 players, and keeping the squad together for the first two games, will be good for us. “But we’ve got some hard work to do before Italy. Everybody realises the importance of the first two games and the momentum it can create by getting positive results. Robin McBryde says Nice is just like Llandudno! “We can’t afford to rest on our laurels. Italy are a tough nut to crack and we have some areas to improve on from last Friday. “Hopefully, the conditions will be a little bit more favourable on Saturday and we are really looking forward to it. We’re monitoring one or two players still but other than that we have good numbers on the ground. “Nobody has been ruled out at this moment in time. It’s about measuring the merits of each individual and deciding who needs game time. If Warren Gatland decides to make changes, then there could be some Six Nations debuts for certain players. One of those keeping his fingers crossed is the outstanding Wasps flanker, Thomas Young. With two caps already to his credit on the 2017 summer tour, he is hoping to follow in his father’s footsteps in playing in the Six Nations. Dai Young was Wales first captain in the Six Nations when Wales met France in the opening game in the expanded tournament back in 2000. If Thomas does get the nod to play in the back row then the Youngs will become the first father and son to play for Wales in the Six Nations. “We’re really happy with how the whole squad have trained back in Wales and during our time down here in France, We’ll have some tough discussions regarding who deserves an opportunity,” said McBryde. 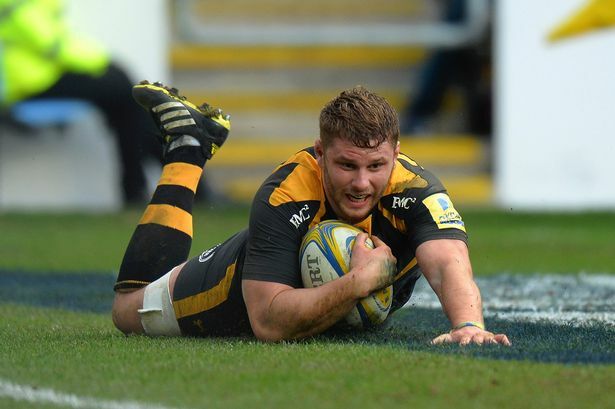 “Thomas Young is a consistent performer for Wasps every week and his selection was based on that two years ago. He’s playing in a league where there are big men to face week-in, week-out and the intensity is there. “In defence, he makes intelligent decisions of when to compete for the ball and, in attack, he links up with the backs. He is doing that here as well. “When he was with us in 2017 it was a snapshot of a tour and there was a lack of preparation time. During the Six Nations you have a chance to look at someone properly. “The fact that he has had the first couple of weeks with us, and been able to bed in, means he has benefitted from that. Our training is a bit different to club level, the intensity and metres covered is up, but he’s dealt with it. “We’ve got several back row men to choose from and we’re testing that strength in depth. Thomas thoroughly deserves his opportunity and it is a chance for his to make a name for himself and stake a claim for a World Cup place. Wales equalled the professional era record of 10 wins in row with their victory at the Stade de France and if they can win again on Saturday they will match the all-time best of 11 set back between 1907-1910. It means there are very high stakes to be played for in the next two games. “You could argue the case for going with the same again, or picking a team that will play against England, or give the guys who deserve and opportunity an opportunity,” added McBryde. “We’ve never looked further than the next game and that will be the case again. Italy are going to be tough, nobody has had an easy game in Italy, and they will buoyed by the last 15 minutes when they came back strongly against Scotland.